The Tropical Art Bouquet is a distinctive arrangement of vibrant purple orchids, orange roses, lemon leaf, and curly willow designed in a low dish. An arrangement like no other, it is an impressive way to send your thoughts and regards to someone special. The placement of each flower will vary along with artist interpretation and lines in the blooms, but the designer will keep to the same color scheme and tropical theme. 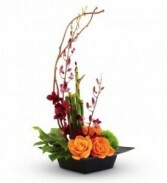 Select this fabulous arrangement when you want to impress someone with the most discerning taste! Red Roses, Dendrobium Bombay, Julep Cup, Pittosporum, Salal, Or Naggai. 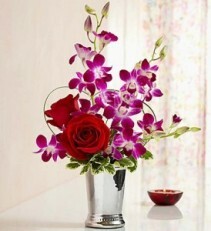 To create this trendy, modern expression of affection, red roses and purple Dendrobium orchids are combined with greenery inside a shimmering julep cup vase. The result is a gift to show your special someone that the best gifts come in small packages! 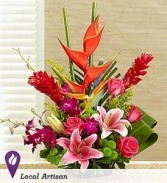 To Bunch Tropical Bouquet From Virgin Farms. Just in! 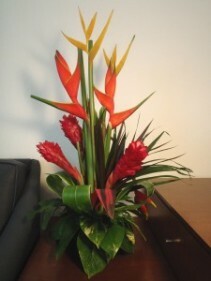 Fresh tropical blooms and foliage!!! 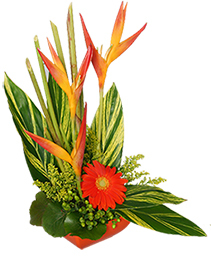 Our designers will prepare a fabulous arrangement of assorted tropical blooms, foliage and other fun surprises that includes Ginger, Heliconia, Musa (that's banana! ), and more! 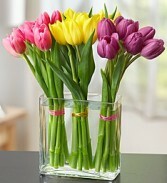 An elegant and colorful gift that no one ever forgets! Roses In Each Of Two Shades Of Lavender, Limonium, Salal. Elegant and soft, this bouquet looks like it came fresh from the garden. 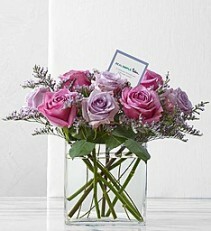 Lavender and lilac to plum roses mingle in a stylish clear cube vase. The delicate floral color palette and modern container make for a striking combination you’ll want to put prominently on display. THE TROPICS MEETS THE COTTAGE GARDEN! 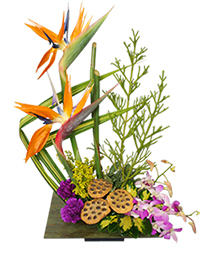 Design Tray, Block Of Oasis, Bamboo Stick Green, Purple Dendrobium Orchids, Stargazer Type Lilies, Solidago, Green Buttons, Red Ginger, Heliconia, Bird Of Paradise, Hot Pink Roses, Green Ti Leaf, Pittosporum Or Salal. Island beauty meets the English Garden in this beautiful arrangement of Stargazer lilies, Dendrobium orchids, ginger, heliconia, and more. Deliver a little piece of Paradise today! 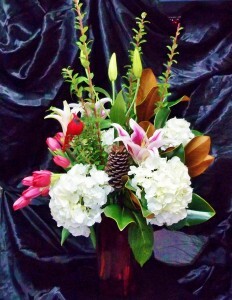 Magnolia, Tulips Red Or Pink, Huckleberry Or Myrtle, Starfighter Lilies, White Hydrangea, Red Roses, Cardinal, Red Vase. White Hydrangea, Pink Oriental lilies, and a clutch of Tulips are framed by Magnolia and other foliage with Mr. Cardinal perching on a branch, creates a vignette from the Southern Forests. A fragrant reminder of Winter in the South. Prange's original, available when tulips are in season. Color of tulips may vary from red to pink. 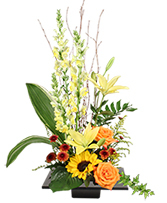 Stunning contemporary arrangement in a burlap wrapped cube. 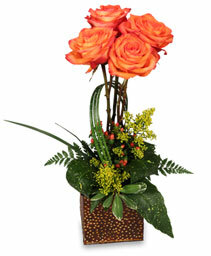 A great vertical design of roses and distinctive foliage makes a fabulous impression for any occasion! SUMMER FIELDS, WITH A MODERN TWIST! 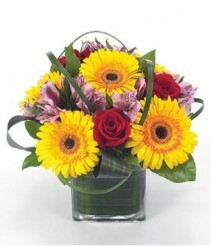 Red Roses, Gerbera Daisies Or Sunflowers, Purple Alstroemeria, Square Glass Vase, Same Day Delivery Available. 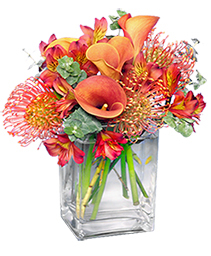 The Ti leaf lined cube vase gives a modern twist to this classic arrangement of gerberas or sunflowers, roses and alstroemeria, creating the perfect gift for a birthday or everyday occasion. 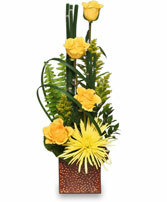 Measures 12"H by 10"L.
Like appreciating a sunny southern day, you'll appreciate Savannah Style. 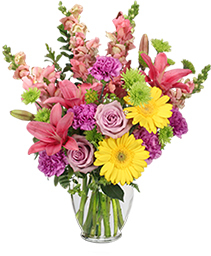 Featuring southern garden blooms such as Snapdragons, Gerbera Daisies, Roses, Lilies, and more, it has a "fresh picked from the garden look' that is appreciated by all. Call Prange's Florist today to order for your favorite person! Regular: Cube Vase With Leaf Wrapped Oasis, Birds Of Paradise, Pincushion Protea, Cymbidium Orchid Blooms, Trachelium Or Green Trick Dianthus Or Green Forest Moss, Woodland Foliage, Enhanced (Shown): Cube Vase With Leaf Wrapped Oasis, Birds Of Paradise, Pincushion Protea, Cymbidium Orchid Blooms, Of Dendrobium Orchids, Trachelium Or Green Trick Dianthus Or Green Forest Moss, Woodland Foliage, Premium (Best): Cube Vase With Leaf Wrapped Oasis, Birds Of Paradise, Pincushion Protea, Cymbidium Orchid Blooms, Of Dendrobium Orchids, Trachelium Or Green Trick Dianthus Or Green Forest Moss, Woodland Foliage. 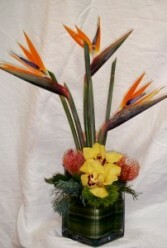 Birds Of Paradise In Cinched Vase With Support Foliage, No Leather Leaf, Plus Curly Willow. 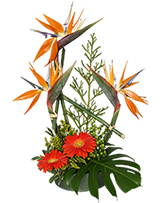 Incredible vased arrangement of Birds of Paradise with support foliage and Curly Willow. 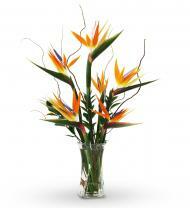 Send them a taste of the tropics, a little exotic drama to truly make their day! Cube With Ribbon Leaf Wrap, White Hydrangea, White Dendrobium Orchids, Cymbidium Blooms In Water Tubes, Steel Or Bear Grass Long, Red Roses. 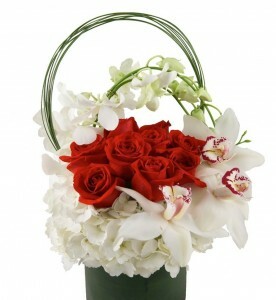 Red roses, white hydrangea and Cymbidium orchids with a twist of modern in a clear vase. Sure to bring a WOW!